This book is all about racism, specifically, how racist ideas about people of African descent led to the institution of slavery and became a unique history, woven into the fabric of American life. This book is nearly 600 pages. I listened to it on audio. Unless you have time to really go through it and make notes and annotations, I recommend that you keep this on audio. I will probably go back through and read this when I have more time, just because of how excessively detailed the information is. That’s a good thing, though. Anyway, Dr. Kendi makes his argument fairly plain–that racism is more than simple “ignorance.” If racism were as simple as people behaving “ignorantly,” Kendi asserts, it would not have persisted for thousands of years, nor would it be the institutional scourge that continues today. Racism is actually a very complex system of ideas, drawn from a number of highly complex sources. Kendi uses five guides into his argument who we’ve all probably heard about in our American history classes in school–Puritan minister Cotton Mather, founding father Thomas Jefferson, abolitionist William Lloyd Garrison, author W.E.B. Dubois, and the Black feminist radical, Angela Davis. He separates these figures into three camps to trace the development of anti-Black, racist ideas: segregationists, people who believe that Black people are to blame for their own inferiority, assimilationists, people who believe that both Blacks and racial discrimination have equal part in beliefs surrounding Black inferiority, and anti-racists, people who reject both of these ideas. Kendi spends a great deal of time with each one of these arguments, and all five of these historical figures who play some part in either building or dismantling racist ideology. 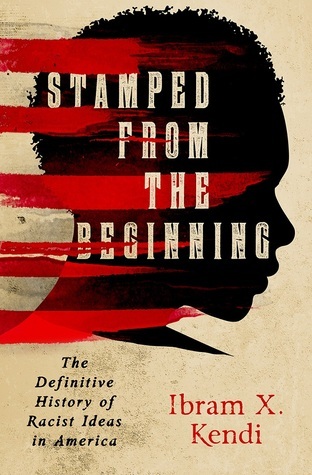 All in all, I found Stamped from the Beginning to be a very complex and nuanced book. It’s also exhaustively researched. Even though I knew that Cotton Mather and Thomas Jefferson were not all that my high school history teacher were telling me they were, this book breaks down their racist ideas in a way that I’ve never quite seen before. This is a book that begs to be read by all people, especially in today’s times. I will definitely also say that I have learned much from this book, I highly recommend it.